Education: Completion of secondary school education. Post-secondary certificate in air traffic control, flight dispatch, aeronautical engineering or related field is essential for Air Operations roles, desirable for Air Movement roles. Language: Fluency in both oral and written communication in the UN language in use at the duty station and in the duty station’s language, if different. These jobs are found in Country Offices (COs), Area Offices (AOs) or Field Offices (FOs) and report to the Aviation Officer. At this level, job holders operate in locations characterized by a complex security situation and/or a higher volume of flights generating additional number of processes and details that must be completed. Job holders demonstrate personal responsibility and initiative to respond independently to queries and problems with only general guidance, using a strong understanding of the local context. There is a requirement to use judgment in dealing with unforeseen problems on a daily basis. Job holders specialise in either air transport or air movement, and perform a specialised technical role, or in some situations may supervise and coordinate a team of staff. Job holders can also be based in an AO or FO with no direct professional technical supervisor on the ground, and therefore expected to resolve routine issues and take decisions quite independently. To provide and/or oversee a range of coordination, administrative and technical activities that support the delivery of a safe and effective air service to the humanitarian community. 1. Provide operational coordination and technical support for air operations, ensuring compliance with WFP standards, including risk management processes, to support safe and effective air operations for humanitarian community. 2. Liaise with airport officials, other local authorities and external parties in order to obtain necessary clearances, documentation and authorisations required for air operations. 3. Carry out pre-flight actions to ensure that all registered passengers and cargo are duly carried on the flight in coordination with crew to ensure safe flights. 4. Collate all post-flight documentation in order to confirm flights have taken place in compliance with established conditions and, occasionally, review and evaluate the performance of air operators. 5. Resolve or escalate operational problems, using initiative, liaising with all parties, and navigating complex security landscapes, to ensure their timely resolution in adherence with WFP standards. 6. Support negotiation of local service contracts in order to establish effective partnerships on optimal terms and conditions facilitating air operations. 7. Research and analyse data, and produce technical reports that enable decision-making and support planning, execution and reporting in order to ensure contractual performance. 8. Update and further develop existing databases and records, ensuring that relevant information is accurate, organised and available for others to access, and supports reporting requirements. 9. Respond to customer queries, following standard processes and obtaining guidance or escalating as required, to ensure timely resolution of all enquiries with a high standard of client service. 10. Build relationships with internal counterparts, in order to support the alignment of aviation activities with wider programmes and ensure a coherent approach to air operations. 11. Supervise the work of other staff, providing practical advice and guidance, to ensure individual and team objectives are delivered to agreed standards and deadlines. 12. Make evidence-based recommendations, and support process reviews and improvements in methods and practices, in order to maximise the performance of air operations and related activities. 13. Establish or maintain minimum procedures necessary to ensure a sound safety management system for the conduct of air operations. 14. Follow standard emergency preparedness practices to support WFP to quickly respond in its core areas at the onset of a crisis. Understand and communicate the Strategic Objectives: Coaches team in the most effective ways to communicate WFP’s Strategic Objectives to WFP team and partners in the field. Be a force for positive change: Implements new methods or tools to improve team’s work processes and productivity. Make the mission inspiring to our team: Maps team’s activities and tasks to specific successes in beneficiary communities to showcase positive impact. Make our mission visible in everyday actions: Explains to teammates how each unit contributes to the overall WFP mission. Look for ways to strengthen people’s skills: Identifies skill development opportunities such as training modules or on-the-job experiences for self, colleagues and direct reports. Create an inclusive culture: Facilitates team building activities to build rapport in own unit. Be a coach & provide constructive feedback: Facilitates the pairing of junior colleagues with coaches within own team. Create an “I will”/”We will” spirit: Proactively anticipates potential challenges and develops mitigation plans to ensure that team meets goals and targets. Encourage innovation & creative solutions: Identifies opportunities to be creative in own work and to help team be more innovative and accurate in their respective tasks and areas of work. Focus on getting results: Monitors team’s deliverables and provides feedback to ensure outcomes are delivered consistently and accurately. Make commitments and make good on commitments: Provides accurate guidance to team on expected responsibilities and tasks, whilst also upholding own commitment to the team. Be Decisive: Sets an example and provides guidance to junior team members on when to escalate issues when faced with challenging issues in the workplace or in the field. Connect and share across WFP units: Facilitates partnerships with other WFP units to accomplish missions in the field. Build strong external partnerships: Sets an example and provides guidance to team on how to build relationships with external partners. Be politically agile & adaptable: Articulates to colleagues or direct reports the value of contributing to other WFP teams and agency partnerships in fulfilling WFP’s goals and objectives. Be clear about the value WFP brings to partnerships: Organizes, monitors, and prioritizes own and team’s efforts to ensure that they will fulfill the needs of internal and external partners. Supply Chain Management and Optimization Displays aptitude at monitoring and reporting on supply chain operations to enable teams to efficiently assess the performance and sustainability of current networks. Planning, Project & Resource Management Collects and analyses relevant technical data from diverse sources to forecast operational needs under various scenarios and makes evidence-based proposals. Information Management & Reporting Collates accurate and timely information and data to enable informed decision making on reporting within individual unit and consequently the greater humanitarian community. Service Provision, Aviation Contracting & Operational Execution Demonstrates ability to negotiate small contracts/ portions of larger contracts in order to establish partnerships that appeal to the best interest of all parties. Aviation Performance Measurement & Quality Control Demonstrates ability to enforce adherence to WFP’s operating and quality standards within own teams to ensure that aviation operations are carried out in a high quality, safe, timely, and responsible manner. Specialized Technical Knowledge in Aviation, Safety and Security Uses aviation systems to monitor operational, safety and security issues in WFP’s aviation services such as airlift and airdrop operations, evacuation flights, and other chartered flight operations. • Experience in dispatching flights from uncontrolled airfields. • Experience in interpreting operational flight plans. • Experience in fuel planning, fuel management and supervising refuelling operations. • Experience in airside operations and marshalling procedures. Candidates from Tunisia and Libya are strongly encouraged to apply. Internal candidates should apply through the E-recruitment platform. 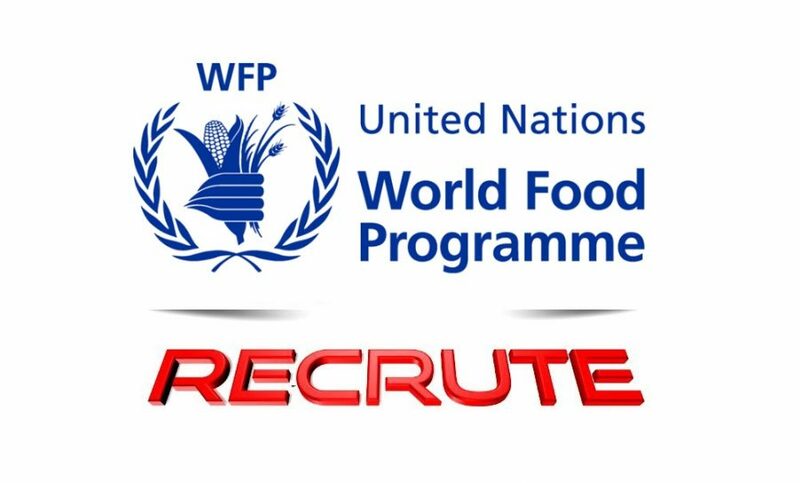 External candidates should vist WFP website through the following link http://www1.wfp.org/ and then go to GET INVOLVED career section to apply. WFP has zero tolerance for discrimination and does not discriminate on the basis of HIV/AIDS status. To apply for this job please visit career5.successfactors.eu.